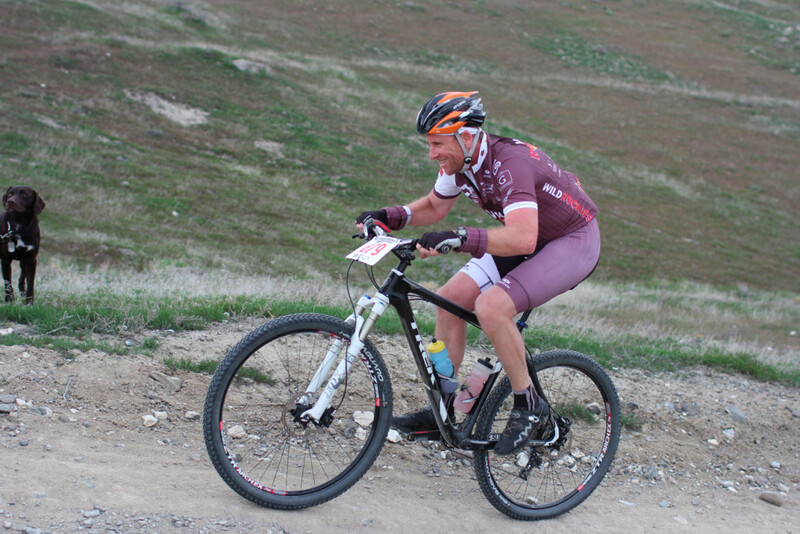 Once again, the 43rd annual Bogus Basin Hill Climb attracted the largest and most competitive field in the region for a single day amateur cycling event. It is the measuring stick by which cyclists compare themselves. The event is mass start, but with individual timing for both start and finish, and there are no awards or prizes other than bragging rights over your time. The course is 15 miles of chip seal pavement along Bogus Basin road from the North End of Boise up to Bogus Basin Ski Area. The course starts with a two mile climb, features 12.5 miles of climbing with an elevation gain of 3400 feet, and finishes with a 1.5 mile flat section. This year’s event was held on August 15 under perfect weather conditions with a temperature of 65F at the 9:30AM start. Apparently, cycling is similar to politics. As individuals identify as “left” or “right” with a minority of “centrists”, cyclists identify as “road” or “off-road” with a minority who enjoy both, and cyclists of one persuasion denigrate those of the other persuasion as not being true cyclists. The BBHC attracts cyclists of both persuasions, even though it is not either. Wind resistance is a major factor in all other road races, but it is only a minor factor in BBHC, so drafting and aero bike position are not very significant. The predictable paved surface provides no dividends for the technical bike handling expertise of the off-road cyclists. 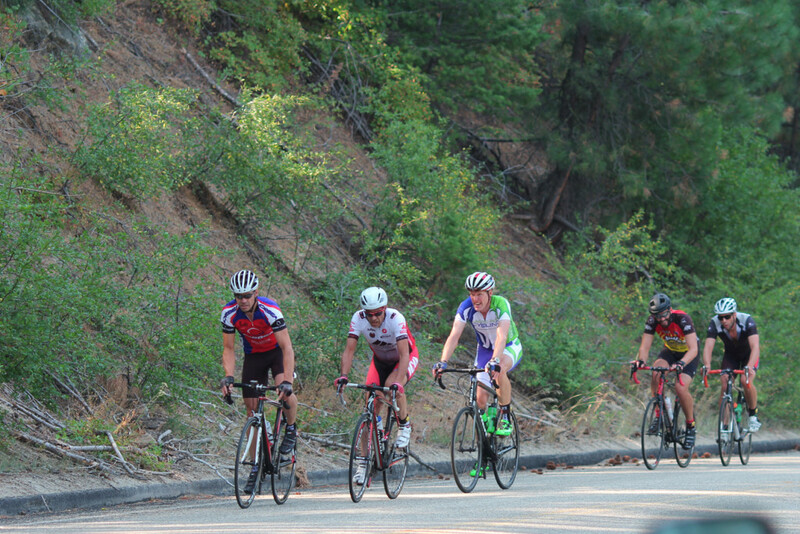 The ~1 hour climb requires specific training by all, and most participants view BBHC as more than an annual event, the highlight of the annual cycle. This year’s winner is local top racer Kai Applequist with a winning time of 54:24, which is typical of recent winning times. The second place finisher is local U19 phenom Ethan Reynolds at 4.5 seconds back. Third place was taken by Ketchum, ID, resident Richard Feldman who is M45-49 World Time Trial Champion at 16.5 seconds behind Kai. Fourth place was taken by local two time Olympic Gold Medal Time Trial Champion Kristin Armstrong-Savola at 52.7 seconds behind Kai. The fast group of the next eight riders finished 1:50 behind Kristin. In addition to BBHC, I have also ridden in a couple of recent Individual Time Trial events with Kristin and Richard, and their results in flat ITT have been equally exemplary. I know that Kristin is going to the World Championships in Richmond, Virginia, next month. It appears that her preparations are on track for an ITT podium finish, and hopefully, this will earn her a spot on the 2016 USA Olympic Cycling Team. It also appears that Richard is on track to defend his M45-49 ITT World Championship. 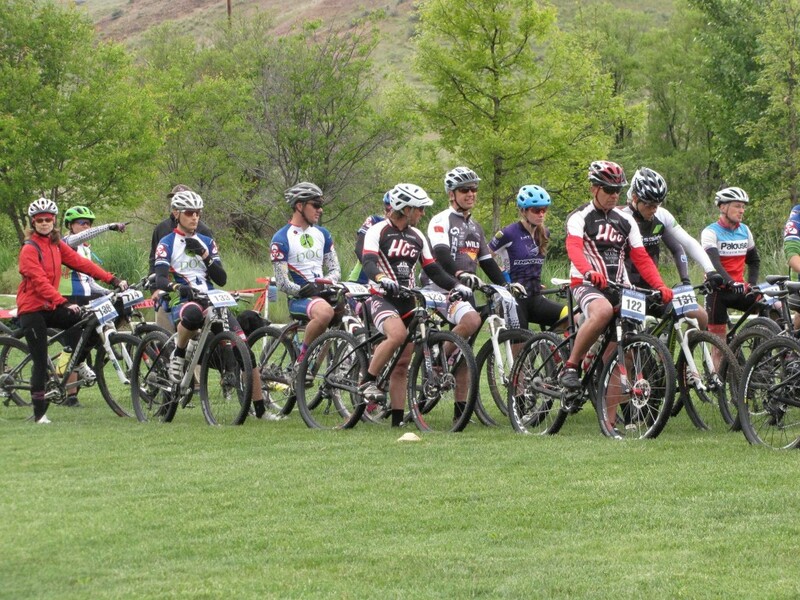 Westin and myself were the only Wild Rockies Race Team BBHC participants, and we did not make the top ten Overall. I was not able to compete against my personal best from last year’s BBHC, as I lost five weeks of training due to sickness in late Spring, and I had not yet regained my mid-Spring form. However, I was able to make the best possible race effort: good warm-up without burning-up too much energy; consumed energy gel packet and big slurp of water 15 minutes prior to race start; good start, joined group of equal strength riders, and made it to half way mark without over / under doing it; consumed another energy gel packet and more water on the mile 10 flat; finished stronger than the rest of my group. I finished 3rd out of fifteen in my 60-69 age group, 2:08 off my personal best, 4:00 off my season goal and nearly 7:00 ahead of Westin. (My wife has pointed out that I can continue working toward my season goal until Cyclo-Cross season starts, as I already took my September rest in June.) Westin finished 17th out of 33 in the M50-59 age group. Several of these Competitive Aspects peak during early adulthood (i.e., the twenties and thirties), and then degrade with age. Hence, it is necessary to structure bicycle races with age categories to allow older athletes to enjoy the benefits of competition. It is natural that the largest proportion of bicycle racers are at their physical prime age, and that there are proportionately fewer bicycle racers in the more senior age categories. Also, there are only a few who take up bicycle racing beyond their physical prime age. Some of the “Prime Age” bicycle racers have mastered most of the Competitive Aspects, and these are the top contenders. However, many of the Prime Age bicycle racers are comparative beginners having mastered only the fitness or skills aspect, and they finish behind the top contenders. The comparative beginners take encouragement from finishing with their peers and knowing they have the opportunity to improve their performance by improving upon their Competitive Aspects. Some of the comparative beginners advance, and some fall out of the sport, as life’s demands pull them in other directions. The result is the level of expertise in all the Competitive Aspects increases in the “Age Group” bicycle racers and there are fewer comparative beginners. The senior Age Group bicycle racers are no longer able to compete with the Prime Age bicycle racers, but the level of competition within the senior Age Groups is often as high as for the top contenders in the Prime Age group (i.e., as measured by heart rate relative to Heart Rate Maximum), as some of the senior Age Group bicycle racers are former Prime Age group top contenders. 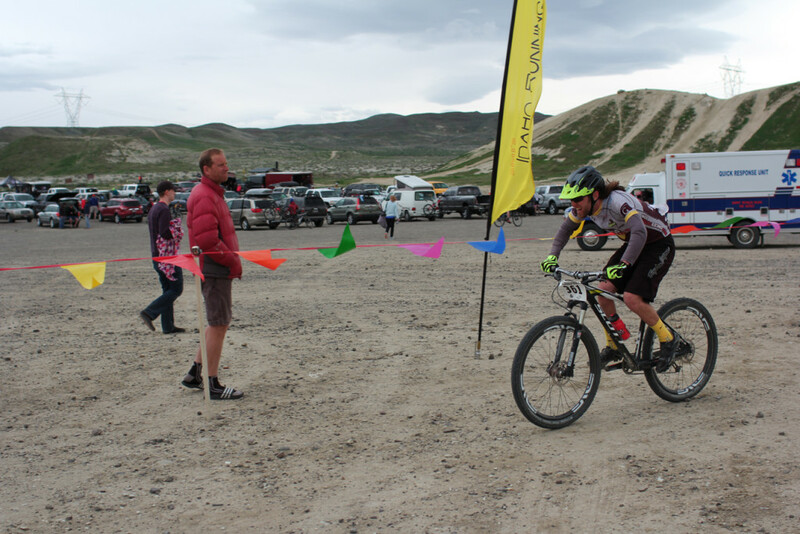 While finishing last (or near last) is considered as finishing poorly amongst the Prime Age group top contenders, it becomes less of an indication of failure for the Age Group bicycle racers, and it can even be a significant accomplishment. 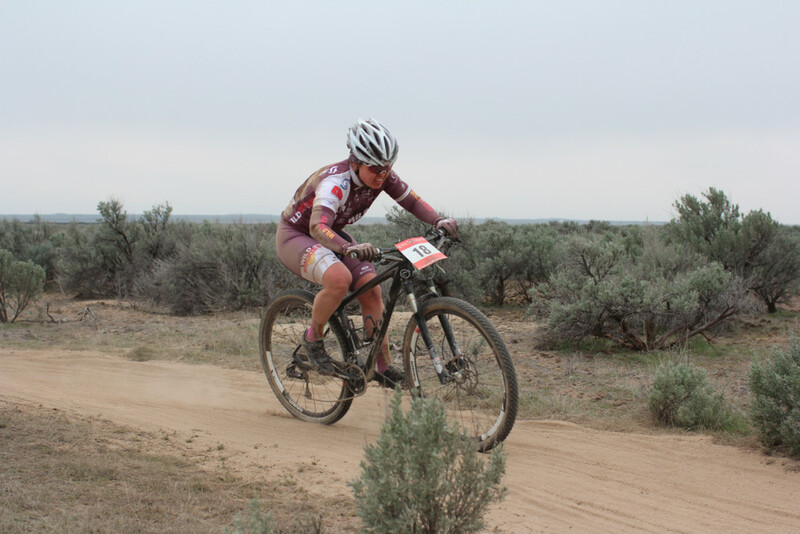 “I may have finished last, but I was in the main field that included some of the top bicycle racers in my age group (i.e., versus finishing off-the-back, or lapped)”. Last week, I rode in the Male 60+ State Criterium Championship. 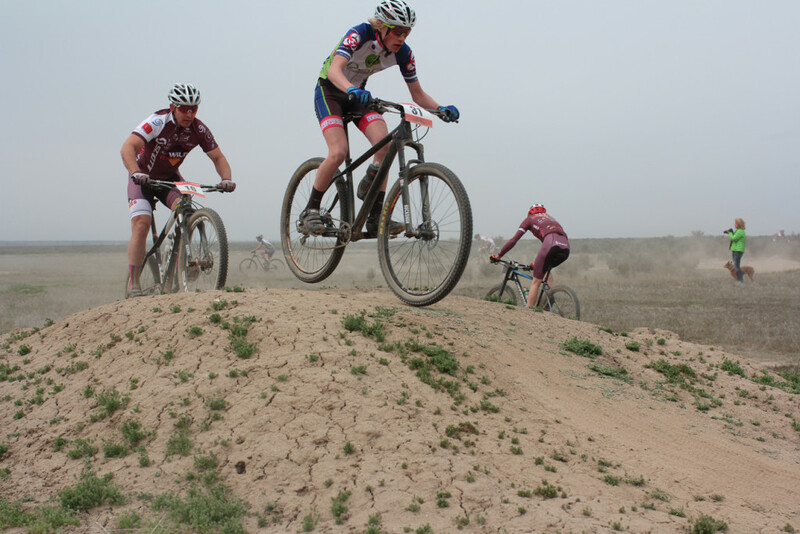 The field included a total of six riders, among them the current national champion and a former national champion. I knew from the start line-up that I was the weakest rider in the field. The race was a very short 20 minutes, so proper warm-up was required to be able to respond to the inevitable early attacks. Also, the small field meant that each rider had to respond immediately to each attack, or be dropped (i.e., rather than having the option of falling back into a larger field). 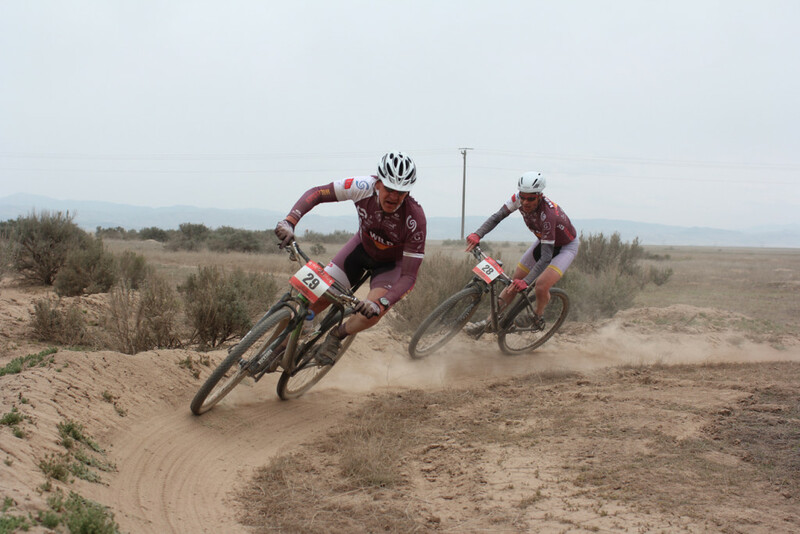 The national champion and the former national champion are team mates from out of state, and they were able to trade-off attacks until the national champion was able to break away. Then it was time for the four state residents to race for the state championship, and since three of us are team mates, we did not want the fourth guy to succeed, as he had done in a race against us one week prior. One of my team mates was able to attack from the back as soon as the pace slowed, and I was in position to block the fourth guy from chasing. My team mate went on to win the state championship, and I finished last at the back of the remainder of the field after attempting a couple attacks in the final laps. It was a successful race for both my team and myself. Yesterday, I rode in the Male 60-64 State Time Trial Championship. The 20km course was out and back on flat 2-lane chip seal surface with no shoulder and a tight turn-around. None of the chip seal was good, the middle 5k was especially rough, and it was very difficult on the way out into 10-15mph head wind. There were five of us in the field, and all knew three of us were competing for third place, unless one of the other two encountered problem. I under-estimated the strength of the head wind, started too fast, and pushed my heart rate well into the red zone by 1km into the race. This was very unpleasant, and I had to slow down for the next 2km to recover my heart rate. At the turn-around, I could see that my poor start caused me to lose time to both the other third place contenders. I had a good turn-around and finished strong, although last, losing by 29 seconds to one of my third place contenders and 0.2 seconds to the other. It was another successful race, even though I know I could have done better. “Use it or lose it” has long been recognized tenet of physical fitness (including sexual fitness). More recently this has become recognized tenet of mental fitness, and not only for the elderly. It is more controversial, but some advocate this tenet for immune system fitness. Physical fitness is achieved with physical activity. The physical activity can range from elevation of heart rate to 60% of heart rate maximum, HRM, (i.e., HRM = 208 bpm – 0.7 * age) for 20 – 30 minutes/day 3-4 days/week (~300-500 calories/week) to elevating heart rate to 95% of HRM 60+ minutes/day 5 – 6 days/week (~5000+ calories/week). The current “consensus” of medical professionals is there are no benefits of physical activity beyond 80% of HRM for 40 minutes/day 4 – 5 days/week (~1500-2000 calories/week), and it is generally recommended to not increase physical activity beyond this level due to increased risks of injury and illness. It is important to be mindful of the medical professional’s audience. The majority of the public is overweight and does not engage in regular physical activity, and less than 10% of the public engages in physical activity beyond the general recommendation. The majority of the public also has other issues due to indulgence (e.g., smoking, alcohol / drugs) and / or mental conditions. The focus of the medical profession has to be on moving the majority of the public to a fitter (healthier) physical condition. Competitive athletes recognize they push to the limits of physical and mental burn-out, and that it is only possible to achieve peak performance for a few weeks at a time a few times per year. However, competitive athletes realize significant improvements from pushing beyond the general recommendation, increased heart rate maximum, increased power output, increased hormone levels – sexuality, improved competitive performance. Medical professionals warn that competitive athletes risk long term break down of soft skeletal tissues (cartilage and meniscus). This is certainly a greater concern for high impact sports, running, jumping, pivoting. However, this needs to be balanced with the quality of life that is achieved through the camaraderie of being part of a competitive sport culture / lifestyle / family. Many mental activities are recognized as contributing to mental fitness, but participatory activities (e.g., puzzling, programming, designing, learning / speaking other language, creating art / music / literature, mindful reading) may provide more mental stimulation than passive activities (e.g., observing art, listening to music, mindless reading). The social aspects of mental activity are also extremely important. One must love, be loved, and belong and contribute to a “family” on a daily basis; One must be satisfied with their level of self reliance / responsibility / sufficiency in their life situation. Mental activity is more difficult to assess than physical activity, and self imposed stresses that seem reasonable initially can build over time resulting in unbalanced mental fitness, sleeplessness, anxiety, worry, depression. Modern societal norms push us to reach our “maximum potential”, but the older perspective “simplicity has its virtues” may promote improved mental fitness. 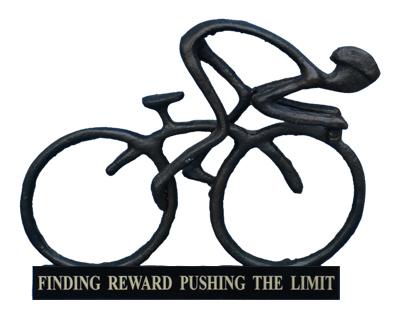 For the case of mental fitness, “Pushing the Limit” corresponds to pushing beyond the blockages of mental (and physical) activity. The idea is that pushing for simplicity reduces stress, allowing time / enthusiasm for mental activity, allowing time / enthusiasm for physical activity, and together, replacing stress-related over indulgence. Immune system fitness enables the body to respond to / recover from infections (bacterial, viral), irritation (arthritic inflammation), allergens, cancer (out of control cell reproduction), injuries and etcetera. One example of the “use it or lose it” tenet regarding immune system fitness is the sharp rise in allergies and asthma in those born in the USA since World War II. This is now being attributed to children being confined to overly sanitary environments, and simply not being exposed to allergens while their immune systems were developing. Recommendations are now emerging to encourage children to play outside frequently and have inside pets. Severe allergies are being treated with exposure to the allergens to improve immune system response. Improving physical fitness also improves immune system fitness and provides many other health benefits. However, when competitive athletes push to the limit of physical and mental burn-out, they occasionally push their immune system beyond the limit, as evidenced by susceptibility to sickness and allergies. It is doubly important for competitive athletes to monitor “resting” and “exercise interval” heart rates, and to back-off the exercise level as soon as heart rate elevation above their norms is detected. Avoidance of activities / behaviors / agents that weaken the immune system is a key component of improving immune system fitness, but these are not always easy to recognize. Over the last ~150 years, modern society has become increasingly reliant on artificial immune system aids. These include wide ranges of vaccines, anti-bacterial drugs, anti-viral drugs, hormones, anti-inflammatory drugs, decongestant drugs, anti-histamine drugs, cell reproduction inhibitors. These immune system aids are justified by disease elimination, lives saved, lives lengthened, lives made more comfortable, but these immune system aids are expensive and may weaken or compromise the immune system and / or otherwise damage the body. It is often possible to treat a “condition” with an immune system aid, and it may help overcome the current “condition” more quickly, but it may weaken the individual’s immune system’s ability to respond to a future condition, as it was not exercised fully with the current “condition”. One case in point of compromising the immune system is the emergence of anti-bacterial drug resistant “superbugs” that have mutated from less troublesome bacteria due to the over prescription of anti-bacterial drugs. Another example of widely prescribing immune system aids without comprehension of the consequences is the treatment of arthritis with “Non-Steroidal Anti-Inflammatory Drugs”, NSAIDs, (e.g., COX-2 inhibitors such as Vioxx, Bextra, Celebrex) that caused many heart attacks / deaths. The point here is that while immune system aids can effectively treat a condition, they are often over used, perhaps to the detriment of the individual’s immune system or general health. For the case of immune system fitness, “Pushing the Limit” corresponds to pushing to limit the usage of immune system aids to the lowest level possible (i.e., a certain number of humans are required to maintain viable gene pool – Ha ha, just kidding). It may seem overwhelming to attempt to tackle all these physical, mental, immune system fitness aspects simultaneously, but they feed off each other. For example, a physical fitness regime often leads to short term stress relief and improved sleep, and this leads to interest in mental fitness activity. Enthusiasm for higher level physical fitness follows, and then it is realized that the daily arthritis medications are no longer required and the immune system is healthier (e.g., fewer days of sickness / pain, quicker recovery from sickness / injury). 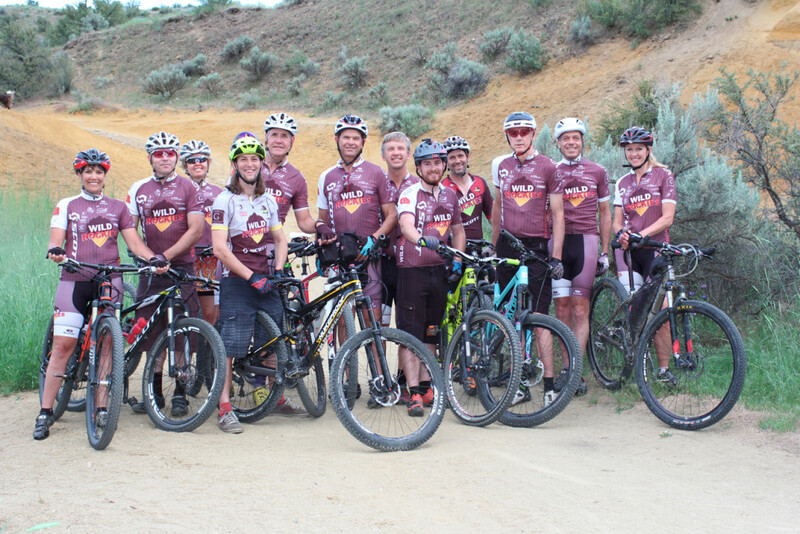 The Wild Rockies Race Team assembled on Monday June 1, 2015, for a team photo session at the junction of Lower Hulls Gulch trail and Red Cliffs trail. The photographic crew of Michele Swan and Fritz Stafford found, as expected, that a group of middle aged adults follow instructions no better than middle school students. The big challenge was to capture two good photographs, the first representing our new sponsor aftersportswear.com with their banner and the female team members wearing aftersportswear.com skirts, and the second photograph sans skirts and banner. This is when it also became clear that a group of middle aged adults have an attention span that is no longer than a group of middle school students. You can judge the quality of these photos, as I am overly critical. The original aftersportswear.com photo, IMG_7778 is underexposed and the fill flash failed to fire because the camera exposure system was fooled by the big white banner in the center of the subject. I attempted to correct for the background underexposure with Photoshop “Levels” adjustment layer in the IMG_7778_Levels version, but the lack of fill flash cannot be corrected. WR Race Team Members depicted above from left to right: Kirsten Wallace, Darren Lightfield, Weston Wheat, Sara Lloyd, Don Reiman, Bill Salter, Jed Clawson, Fritz Stafford, Andy Kemp, Gary Kyle, Mike Wieser, and Sharon Sell. 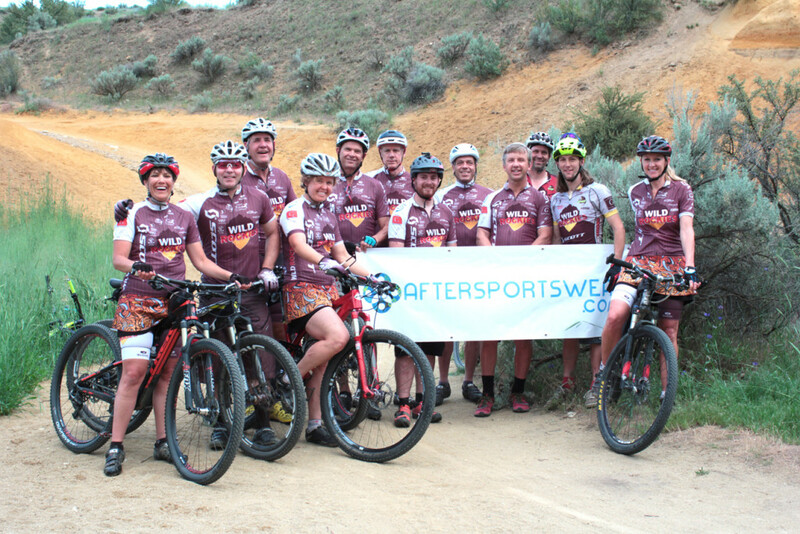 We will try another Team photo after the next kit order arrives, perhaps up on the “Around the Mountain” trail at Bogus, or the “Rock Sculpture” section of the “Broken Horn” trail at Avimor. I hope we can get more of the Team to show up. The photographs included in this article were taken by Michele Swan or Fritz Stafford. To see / copy the full resolution available in these “quarter resolution” images, click or tap the images to bring-up the attachment page, click or tap on the image magnifier located between the image title / filename and the image, and then right click on the image to copy (on a PC). Instructions to purchase the full resolution photos are available at Fitness and Grace Photo. The Coyote Classic has the reputation of being the most technically challenging course in the region available to amateurs of all levels, and the 2015 edition lived up to this reputation. These technical challenges combine to provide significant advantage to those who are able to negotiate them most efficiently. 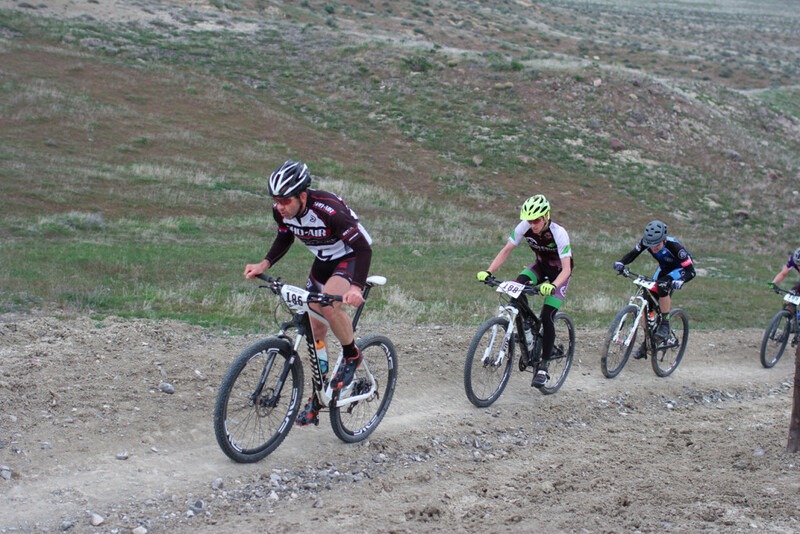 The Wild Rockies Race Team entered two racers in the Cat3 race, one racer in the Cat2 race and two racers in the Cat1 race. The May 16th race was treated with moist cool spring conditions. The race start was delayed 2.5 hours due to the possibility of morning rainstorms that could have made the course un-ride-able, but the storm bypassed the race venue. The weather conditions at race start were nearly perfect, 58F, overcast, 10-15mph west wind. Spring had come ~1 month early, and warm dry mid-spring conditions had raised concerns for an early, lengthy fire season. The 1+ week of moist cool weather that preceded the race brought a tremendous bounty of late spring flora including camas, lupine, cinquefoil, morels, syringa, choke cherry and much more. The vast majority of the course is on active cattle ranch that provides unique character, cows on the trail including bulls, deep hoof prints that enhance trail roughness, wallow pits of soft sand, squishy cow pies that were still warm, bone yard, narrow trail along creeks eroded to barely tire width by cows climbing in / out of the creek. Some described the course conditions as “Hero Dirt”, and indeed this was the case for much of the course, but there were enough moist and muddy sections to have significant impact. 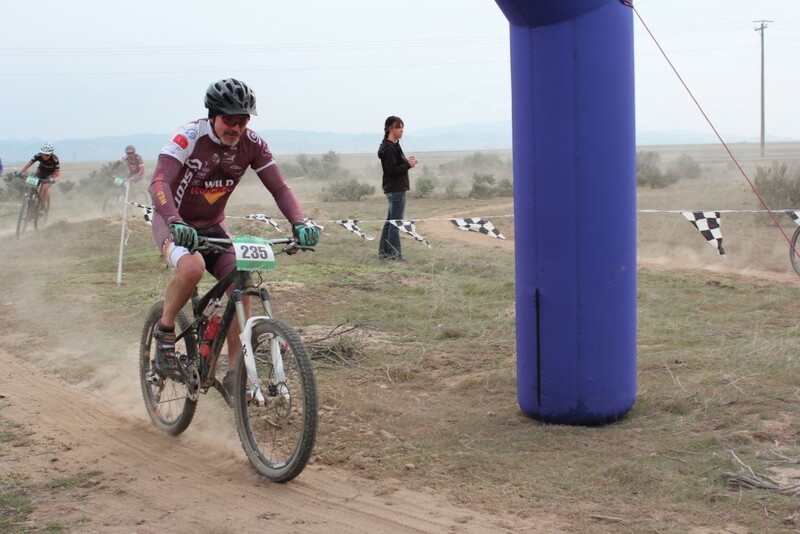 At race end, all bikes were heavily coated with mud and cow dung. The course has two loops, the south shorter ~8 mile loop is the Cat3 course, the north longer ~16 mile loop is the Cat2 course, and the Cat1 racers race both loops with mass start that includes the Cat3 racers. Both loops have the same 3.3 mile finishing descent down Spring Creek, 100% single track, two wet rocky creek crossings and one bridge, constantly curving trail with limited visibility of the innumerable rock and root and brush obstacles, and to keep the racers on edge, multiple technical rock features that are easy to flub under race conditions, all have been ridden, but most racers choose to carry their bike over the biggest one. The Cat2 race was launched onto the Cat2 loop first, and the Cat1/3 race was started 5 minutes later under “controlled” pace to the start of the Cat3 loop (i.e., pace controlled to “Cat1” pace that provided separation by the start of the Cat3 loop, which begins with a climb that provided further separation). 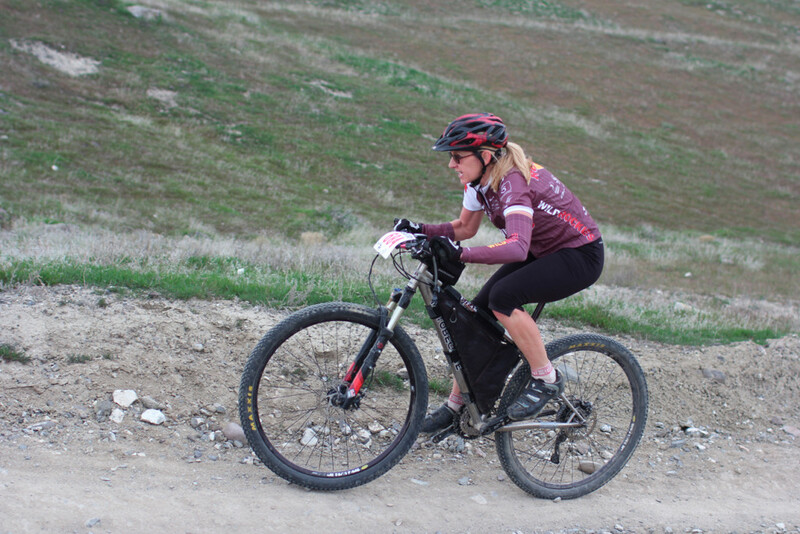 After an initial climb, the Cat3 loop proceeds with a sketchy descent that begins with loose rock, followed by soft sand curves, a dip through some willows, a short very steep rise, then drops down onto the Broken Horn trail. This trail climbs up the creek bed, with initially moderate steepness, through the “rock sculpture” section, followed by short descent into tricky loose dirt sharp left steep climb-turn that leads into the steep “stair climb” section. This stair climb section is ride-able (for experts), but any flub-up leads to walking the rest of the section. The trail then climbs out of the creek bed up into the “hills and dales” section, which is largely two-track trail that provides ample passing opportunities. Several hills in this section have pitches that are steep enough to test the climbing skills of Cat3 racers. The “hills and dales” section concludes with a “flowy” single track descent into the short deep mud section that leads to the top of the Spring Creek descent. 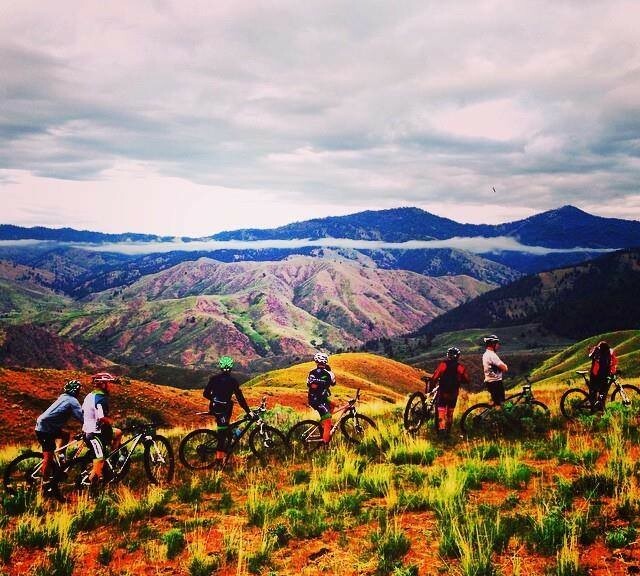 The Cat2 loop begins with curvy single track section that climbs up and over the ridge that separates Spring Creek from Bovine Nirvana. This section includes multiple technical features with the highlight being a curving bridge with a boulder in the middle that crosses a narrow gulch. The penalties for failure to negotiate some of these technical features can be more severe, as Fritz experienced during practice 10 days before the race and led to a DNF and trip to Emergency Room for Andy. The climb from Bovine Nirvana up to the Willow Creek trail head is moderately steep, pocked with cow hoof prints, and long enough to burn up fuel needed for the upcoming main climb up Willow Creek. The beginning of the Willow Creek section is usually fast, but on this day there were several muddy sections that slowed pace and increased effort. The Willow Creek crossing was deeper than usual, and the immediate left turn up the steep bank had to be anticipated. After a couple of switch-backs comes the next bridge, and it has tricky entrance and exit that need to be anticipated. The trail up Willow Creek begins with moderately steep pitch, but constant attention is required to maintain speed and negotiate obstacles leading to the hike-a-bike up and over a rock outcrop. After a short section of more high speed obstacles comes a pair of features, the first being ride-able and the second most successfully walked (for me), and the lower Willow Creek section concludes with a moderately steep climb up to the cross road. The upper Willow Creek climb is where the course often turns racers into strugglers, and this is where the wildflowers are most abundant. This section starts with a deceptively wide trail and pitch on the low end of moderate steepness, but this soon transitions to moderately steep single track with sections of single tire width single track. Midway up this climb is a pair bridges followed by a short very steep pitch out of the creek bed that signals the start of the steep soon to become very steep upper climb. Up to this point, most Cat1 racers have been able to maintain full race pace, but this soon becomes impossible for racers who have not fueled and hydrated sufficiently. My estimate is that I needed to have consumed two “Goo” packets and drank a large water bottle, but I had only drank ~half a large water bottle and consumed no “Goo”, and I bonked. This is where you realize that you are out of gas, and cramps start to set-in, but you have to push yourself remembering “if this is hurting me, then it is also hurting the competition”. Then you get to the ridge top road crossing which is not the top of the climb, as there is an immediate short steep climb, followed by short very rough section, followed by short very steep climb back up to the ridge top road. This leads to the final section of single track before the rough two track descent. I have struggled with this final section of single track, and I have also seen others struggle. It starts with short moderate steep climb, and then becomes downhill-flat fast. I suspect the struggles are due to fatigue / lack of concentration on narrow curvy trail with obstacles. The long two-track descent from the “power line” ridge down to the start of the Spring Creek descent is very rough and very fast for those with skill / strength / confidence. The overall vertical gain for the full Cat1 course is 3350 feet, which is nearly as much as the Bogus Basin Hill Climb. The race course times for the “normal” competitive male are ~45 minutes for the Cat3 course, ~1 hour & 40 minutes for the Cat2 course and ~2 hours & 25 minutes for the Cat1 course. 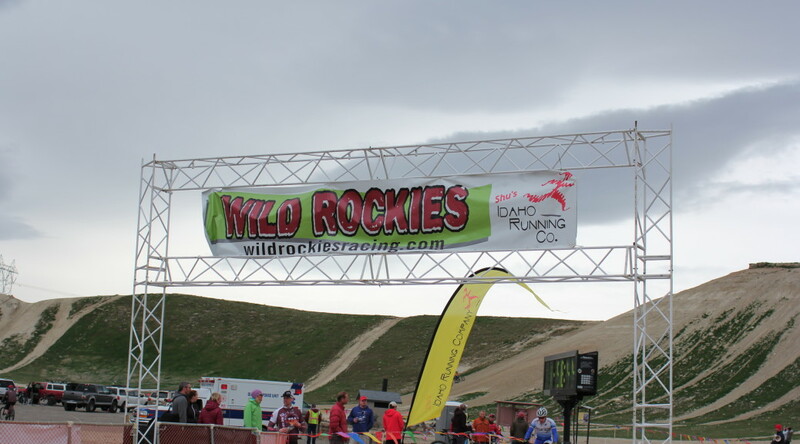 The Wild Rockies Race Team had two podium finishers, Jason 3rd place Cat3 M40-49 and Allis 3rd place Cat3 W30-39, Fritz 4th place Cat 1 M5o+, Weston 5th place Cat 1 M50+, and one DNF, Andy. 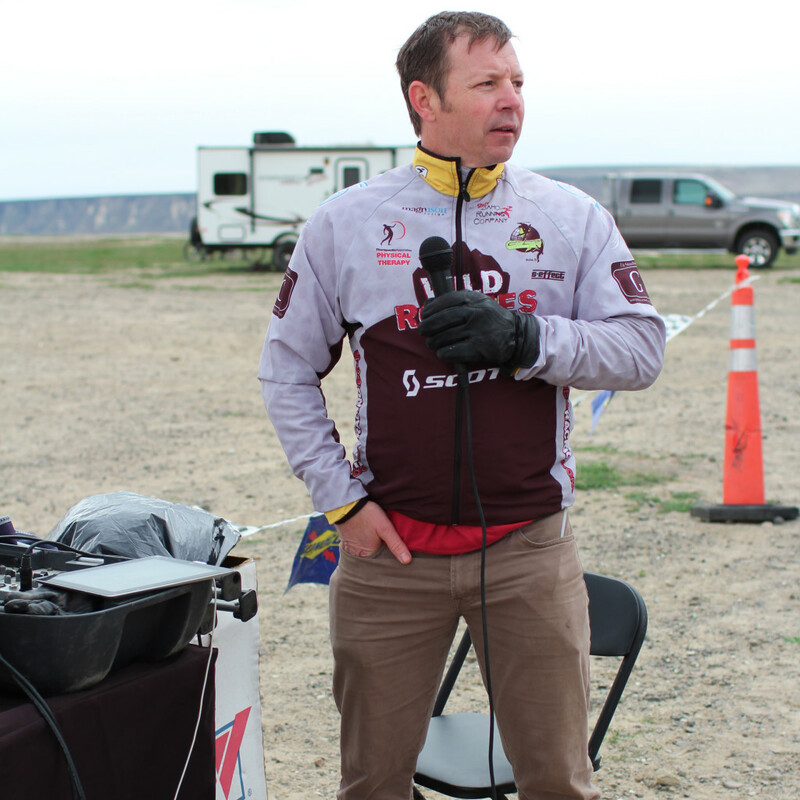 We owe big thanks to Hal Miller, Tim Phillips and all of Broken Spoke for putting on this event, spearheading the development and maintenance of the race course. Unfortunately, Michele was not available to take photographs. 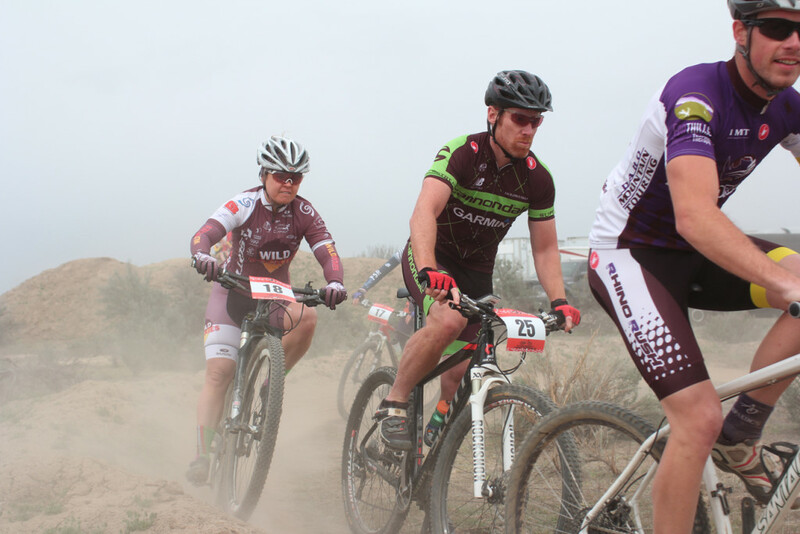 If anybody has any Coyote Classic photos (i.e., practice or race), please add to website Media Library, or send to me, and I will attach to this post. 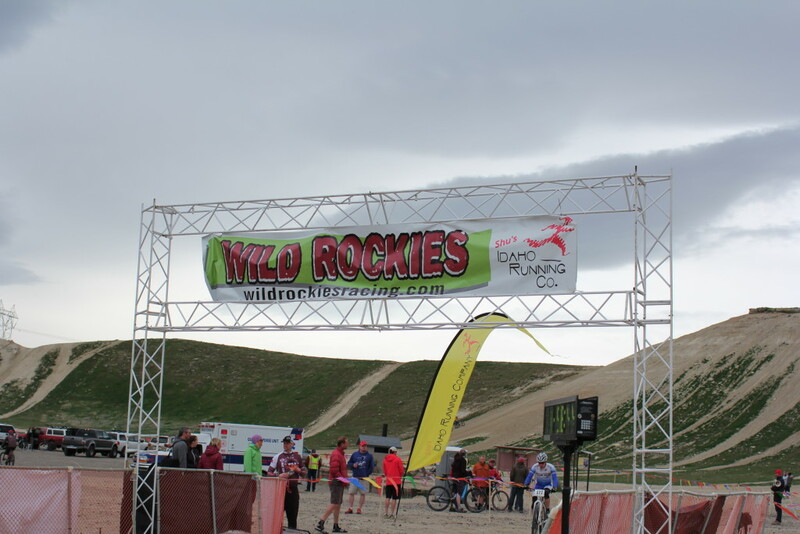 Wild Rockies Race Team fielded a strong group of 18 racers, more than half of our roster, for the 19th annual edition on April 11, 2015. 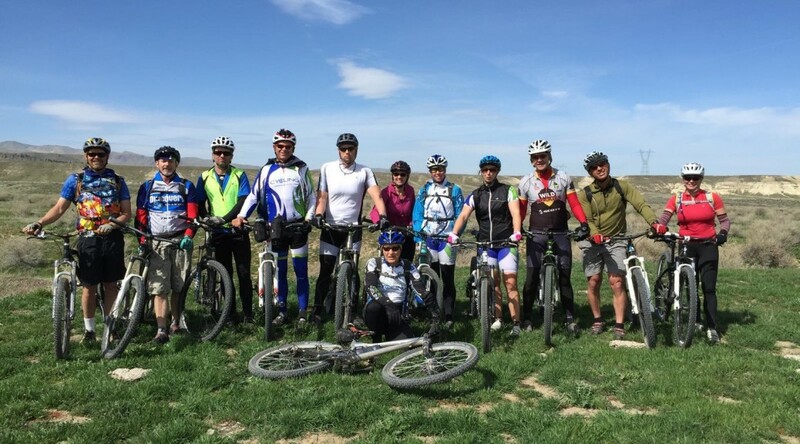 This team included a wide range of abilities, ranging from accomplished Pro to beginning racers, female and male, thirty-something to sixty-something. 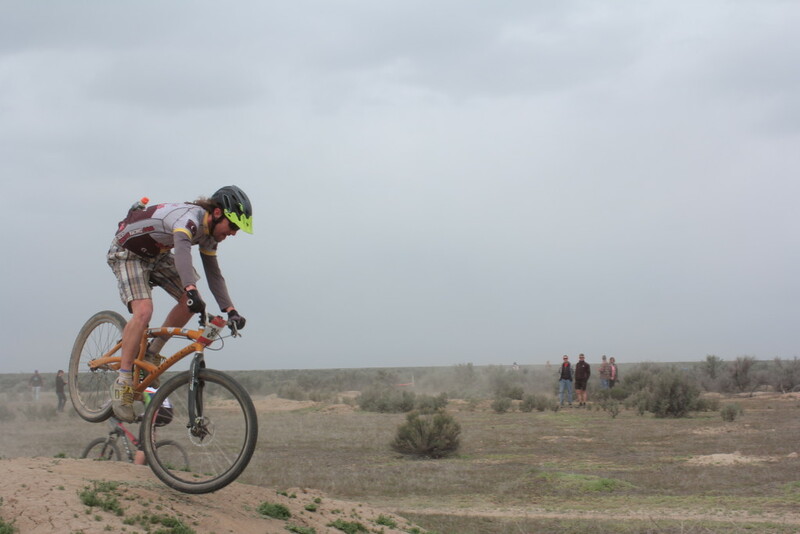 This was the 19th time that XC Mountain Bike racing has shared the Hemmingway Butte Off-Highway-Vehicle Park with motorized trail users, an occasionally uncomfortable pairing. The venue and trail users have undergone significant change from nearly unrestricted shredding of soil and flora to usage being restricted to marked trails only. The motorized trail users now correct the XC Mountain Bikers when they wander off the marked trail during training, and ecological diversity and grazing yield have improved noticeably. The race course followed the same route that has been utilized for the last several years, but the course was the firmest and fastest in recent memory. The course was 100% ride-able for the strongest and most skilled riders, though most riders walked the very steep exit climb out of the Skateboard Park. The course consists of mostly two-track dirt trail, except for the narrow winding Skateboard Park descent down a dry wash. The ascents feature sections of loose sharp rocks that force careful line selection to maximize efficiency and control and avoid flats. 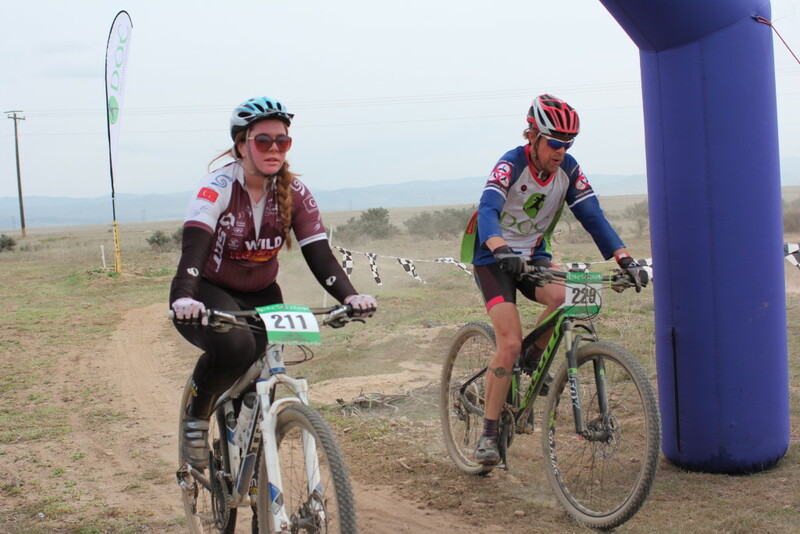 The weather was mid 50F with blustery showers that reminded everyone of the sticky mud hypothermia disaster that occurred two years ago when a thunder storm struck mid-race forcing most participants to abandon, or carry their bikes to the finish. This year the showers bypassed the race venue, but strong winds were noticed, especially on the main climb during the first lap. 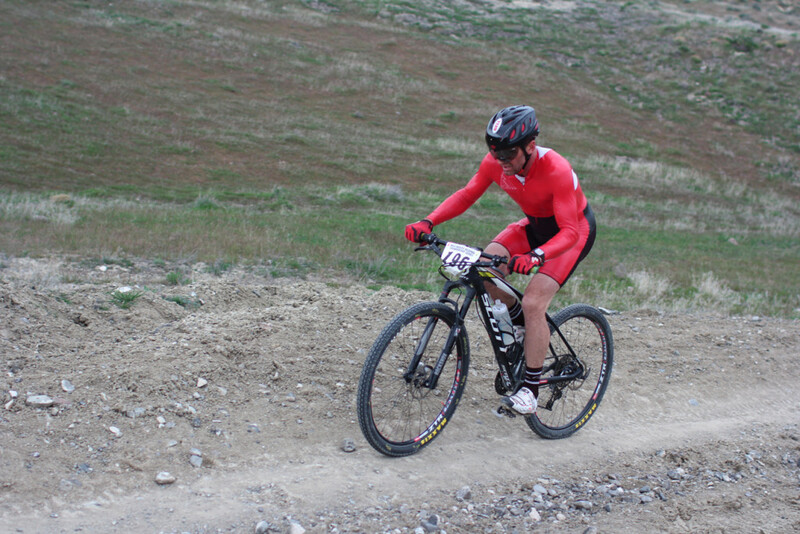 Darren and Lorien Lightfield Wild Rockies Outdoor Event Productions put on a fine Cross Country Mountain Bike Race event, http://www.wildrockiesracing.com. The total field included 134 participants. Several top regional racers and a National Champion participated and demonstrated they are on top form. Jamey Yanick set a new course record of 1:36:06.7 for the Cat 1 race course (30 miles, 3 laps). The strongest racers described the course as “fairly flat”, probably because they were able to ride the majority of the climbs in the big chain ring, or perhaps, demoralization of potential competitors is part of their strategy for long term dominance. The fact is that my GPS cycling computer with barometric pressure sensor recorded 1050 feet of vertical gain per lap, which is a little more than starting at the lower 8th Street parking lot (Foothills Learning Center), and riding to the top of Sidewinder. Wild Rockies Race Team was led by Harri (Dave) Harrison wearing a 1993 vintage shiny cherry bomb skin suit. He was so Aero that he had a helping wind on the main climb of the first lap, while the rest of us had a hurting wind. 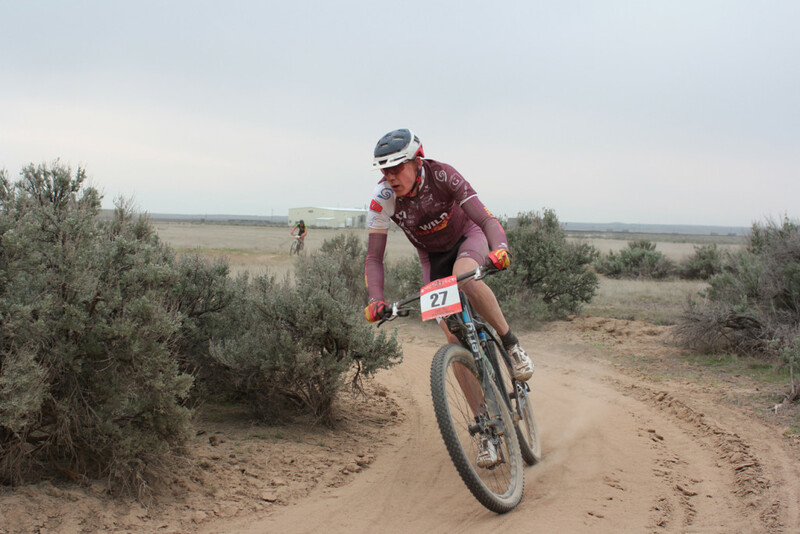 Dave took second place in the Men’s Open Pro/Cat 1 race with a time of 1:53:44, 9:14 behind Chris Ganter (husband of Wild Rockies Race Team participant Allis Ottey) who also won last week’s Sage Brush Scramble STXC race. However, Chris was 8:23 behind the record setting Jamey Yanick. 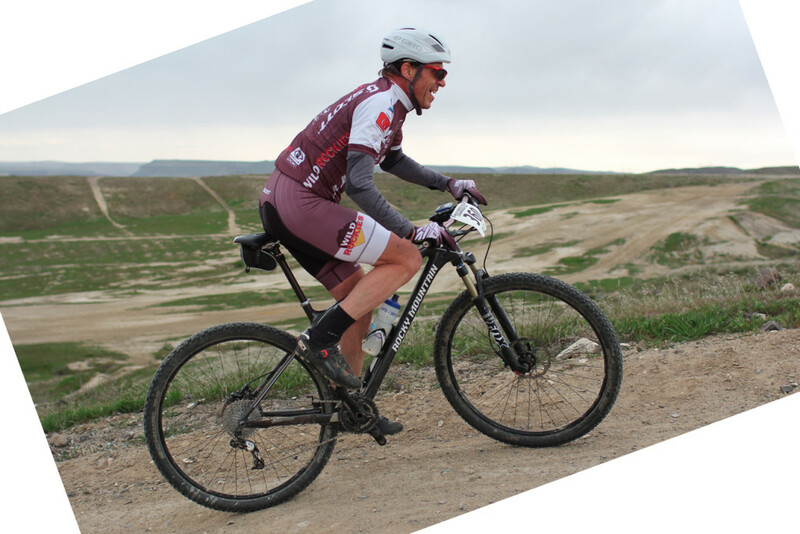 Raul Garcia was the next best Wild Rockies Race Team finisher at 1:58:20, well under the 2 hour goal for most normal humans, and good enough for 4th place in the Men’s Cat 1 40-49 race. The reigning Men’s 50-54 National Champion Jon Gould took first in the Men’s Cat 1 50+ race with a time of 1:51:12, 2:32 ahead of WR Race Team leader Harri. The Wild Rockies Race Team competitors in this race were Bill Salter in 3rd place, Weston Wheat in 4th place and Fritz Stafford in 5th place. 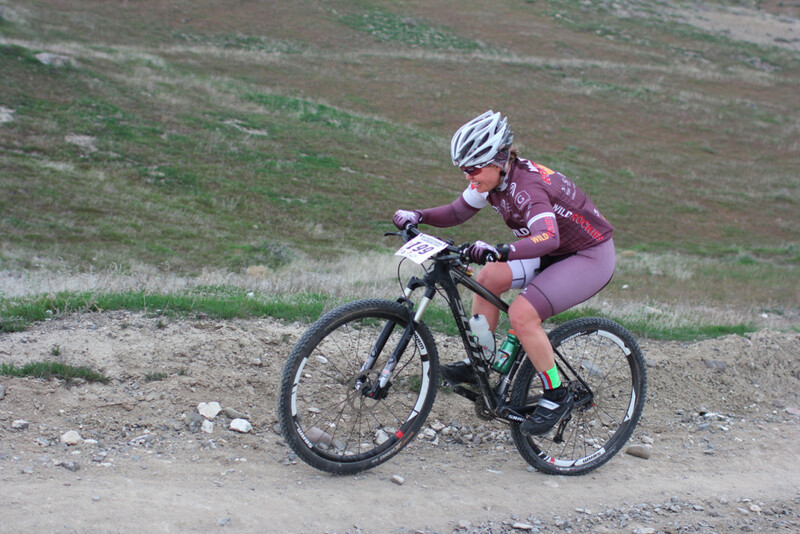 Mike Weiser took a very respectable 5th place in the Men’s Cat 1 30-39 race, and Sara Lloyd took 3rd place in the Women’s Cat 1 30-39, just 42 seconds behind 2nd place Joy Adams. 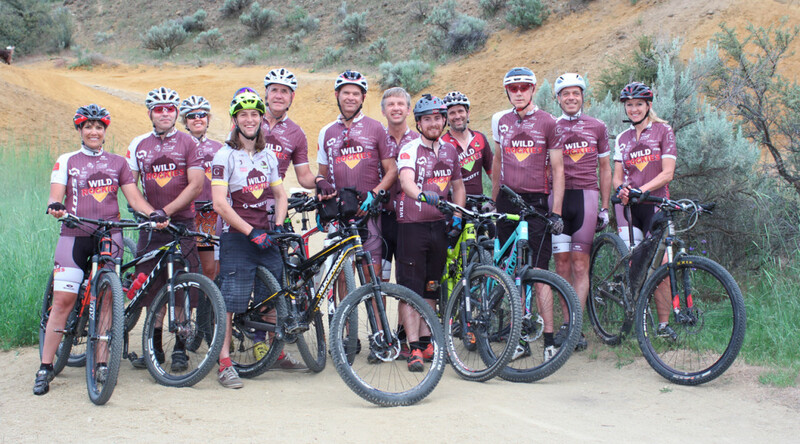 The Wild Rockies Race Team had seven competitors in the Cat 2 race, which is always an interesting race as there are typically one or two racers in each category that are “sandbaggers” who really should be in the Cat 1 race. 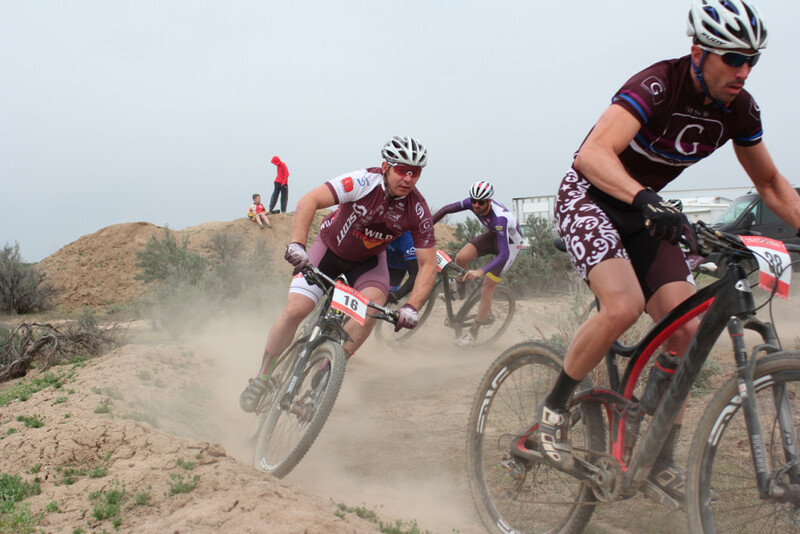 None of the WR Race Team competitors are sandbaggers, but the presence of sandbaggers typically means the true Cat 2 racers are only able to compete for minor podium positions. However, WR Race Team struck Cat 2 gold! 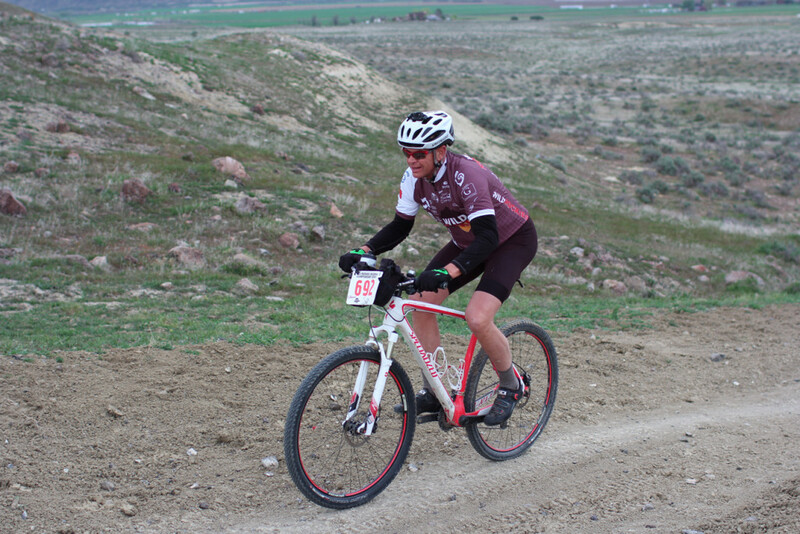 Sharon Sell took 1st place in the Women’s Cat 2 40-49 race, and Don Reiman took 1st in the Men’s Cat 2 60+ race. 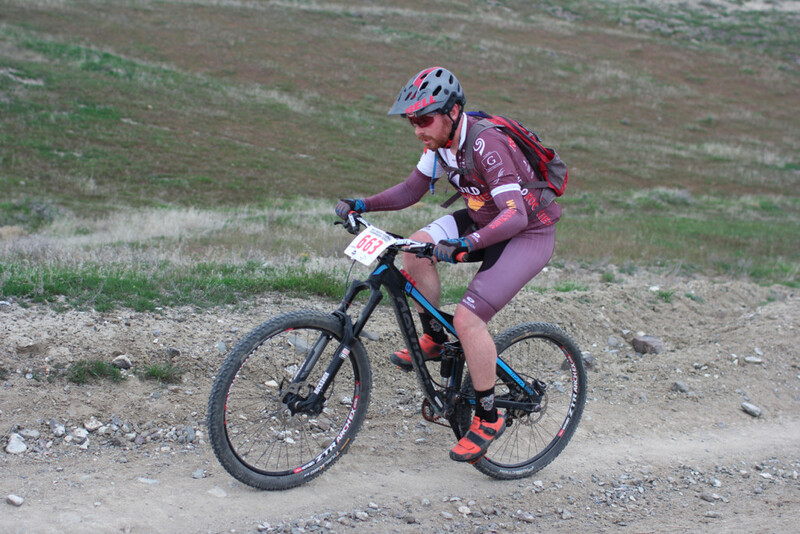 The other Wild Rockies Race Team Cat 2 competitors were Jed Clawson in 7th and Tearle Eide in 10th in the M30-39 race, Jeff Wallace in 8th and Gary Kyle in 16th in the M40-49 race, and Andy Kemp in 3rd place in the M50-59 race. 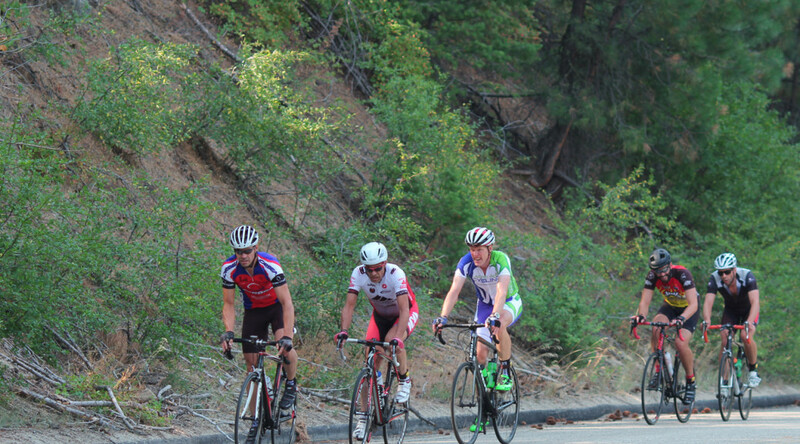 The Wild Rockies Race Team had four competitors in the Cat 3 race, and gold was struck again. Allis Ottey took 1st and Pam Smart took second in the W30-39 race. 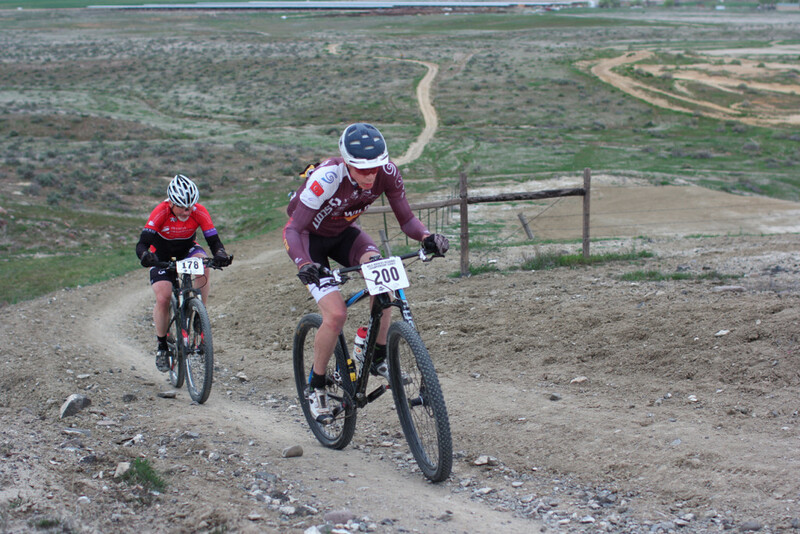 Jason Rose took 3rd in the M40-49 race, and Bruce Chaffin took 3rd in the M50+ race. The photographs included in this article were taken by Michele Swan. 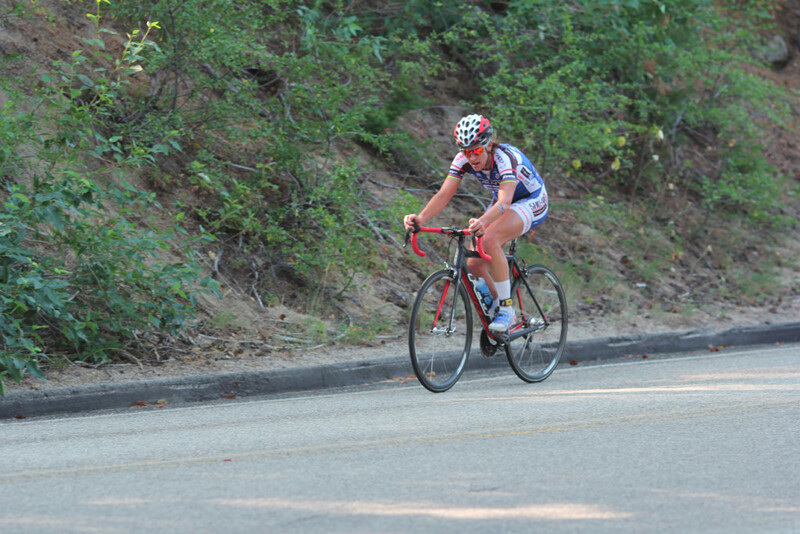 Due to logistical issues, Michele was not able to get to the top of the 1st climb until the beginning of the second lap. Hence, it was not possible to capture any Cat 3 photographs due to race being only one lap. To see / copy the full resolution available in these “quarter resolution” images, click or tap the images to bring-up the attachment page, click or tap on the image magnifier located between the image title / filename and the image, and then right click on the image to copy (on a PC). Instructions to purchase the full resolution photos are available at Fitness and Grace Photo. 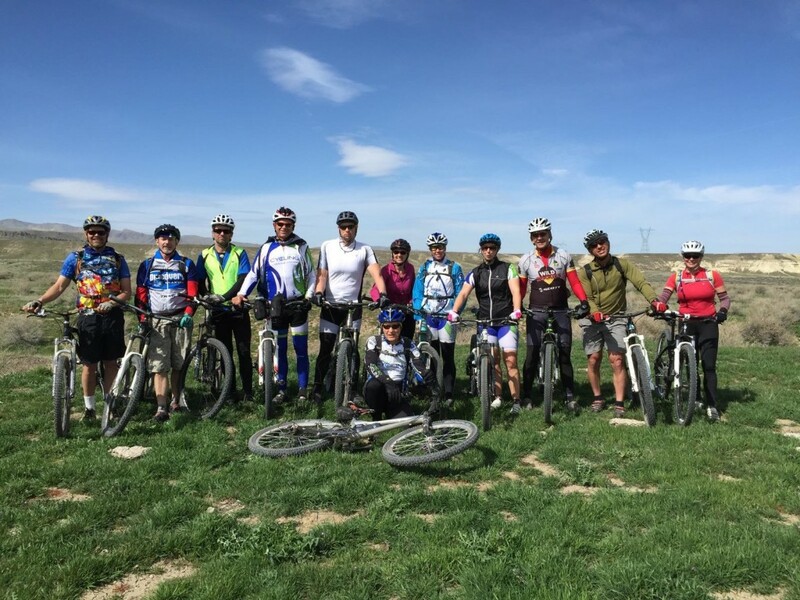 Eleven members of the Wild Rockies Race Team contested the 2015 Sage Brush Scramble on April 4, 2015. The weather was nearly perfect, ~55F, overcast, some sprinkles during the Cat 1 race, but most importantly, mostly mild wind with only a few gusts during the Cat 1 race. The course was significantly improved since last year’s race. The long back stretch, which had provided a passing zone, was replaced with a banked turn, a flat turn, a tabletop, another flat turn, and a “kicker berm”. The connecting section between the back of the course and the front of the course was entirely new. It started with a section of rollers that forced timing of pedal strokes, a pair of banked turns, a flat turn, a sharp banked turn, a pair of flat turns, another banked turn, and three more flat turns. The only passing zone that remained was the transition zone between the back of the course and the front of the course. The front of the course was unchanged. 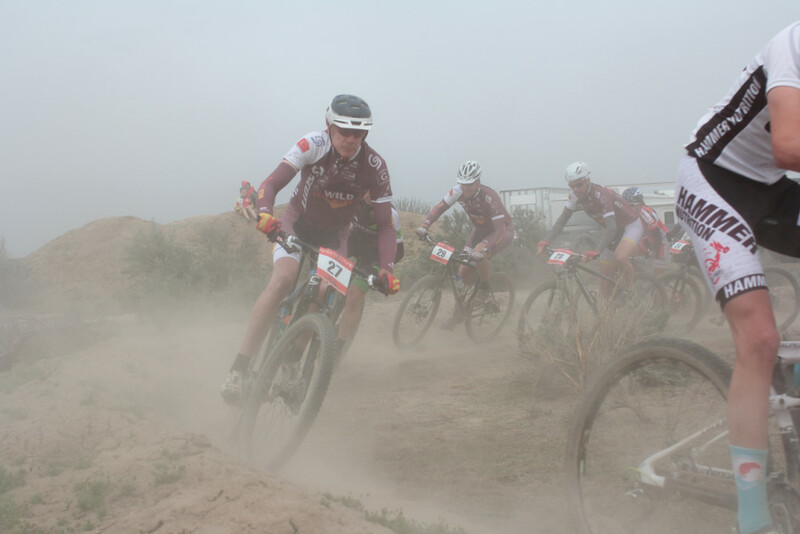 The course conditions were very dusty, as the course was very dry, and the riders were constantly generating fine powder with each passage through each flat turn. 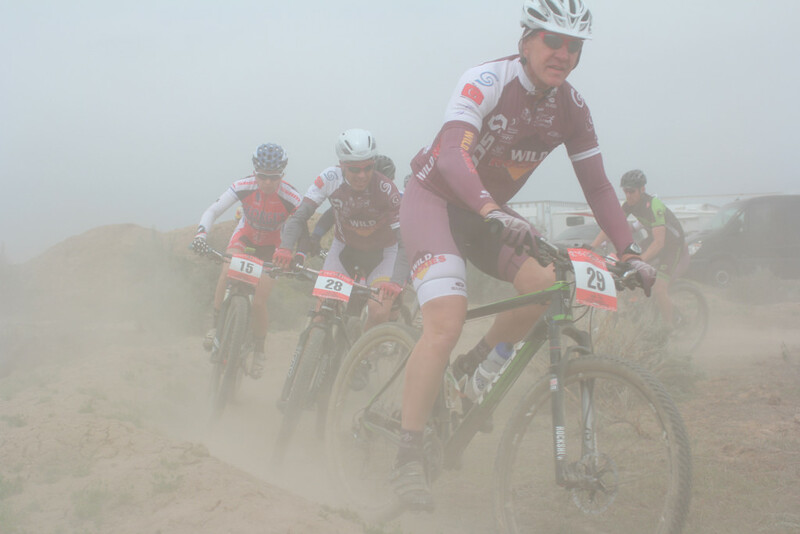 All the riders finished their races covered in dust with dirt on their teeth. During the first lap of the Cat 1 race, the dust kicked up by the first ~6 riders was so thick that the remaining riders could not even see the track. We had to follow the rider in front of us with no ability to pick a good line. As the fine powder built up in the flat turns, they became increasingly “greasy” slippery, and many riders found that it was possible to accumulate even more dirt on their kit by “going for a roll”. I do not believe there was any serious injury, nor equipment damage. These conditions were an advantage for the skilled riders, as us less skilled riders quickly became overly cautions in the flat turns. Not only did the first ~6 – 8 riders through the start of the Cat 1 race avoid the dust visibility problem, they also avoided the bottleneck that forced the rest of us to brake to a near stand-still before the first turn ~50 yards from the start. Hence they immediately gained ~30 – 60 seconds over the rest of the field. I console myself over this frustration by observing that I was able to limit any additional time gains over the remainder of the race by the non-Pro race leaders to a similar amount. The remainder of the Cat 1 race was very exciting. There were numerous Wild Rockies Race Team members and other fans cheering us on. All the racers experienced multiple near-crashes, or worse. Bike handling reflexes were tested, and adrenalin spiked with each incident. Darren was delayed mid-race when the race promoter’s son crashed in front of him taking both of them down. The winner of the Men’s Open Pro/Cat 1 race is Chris Ganter, who is husband of Wild Rockies Race Team teammate Allis Ottey, and true cycling Pro (i.e., makes living from bicycle racing). 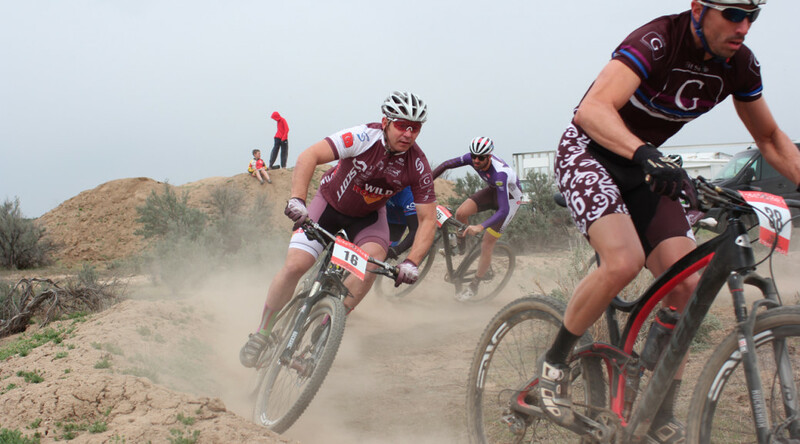 Darren contested the Men’s Open Pro/Cat 1 race, and he took third place podium position. 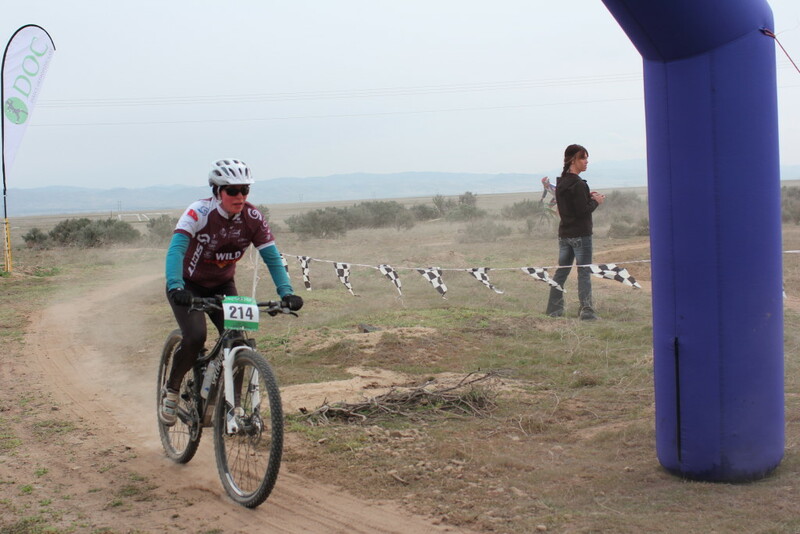 Sara contested the Women’s Open Pro/Cat 1 race, and she took second place podium position. 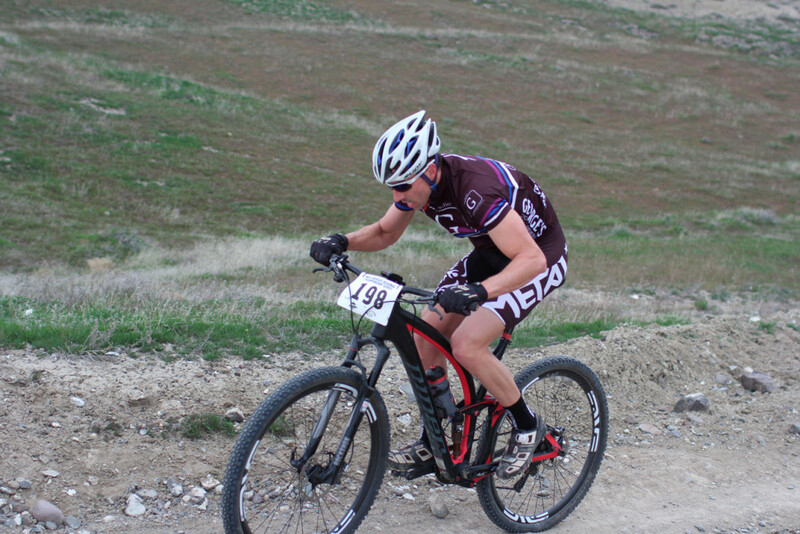 Wild Rockies Race Team had three contestants in the Men’s Cat 1 50+ race, and Bill took second, Weston took third, and Fritz took fourth. Weston and Fritz’s battle for the Men’s Cat 1 50+ bronze provided the most exciting spectator action of the day. Mike led the cheering, and his lap-by-lap comments kept the whole crowd involved, even the officials and score keepers. Weston was ecstatic to beat Fritz, and Fritz was a bit disappointed, but Fritz learned a key lesson on how to launch the last lap pass. Mike rode the Men’s Open Single Speed race, which was included in the Cat 2 race. 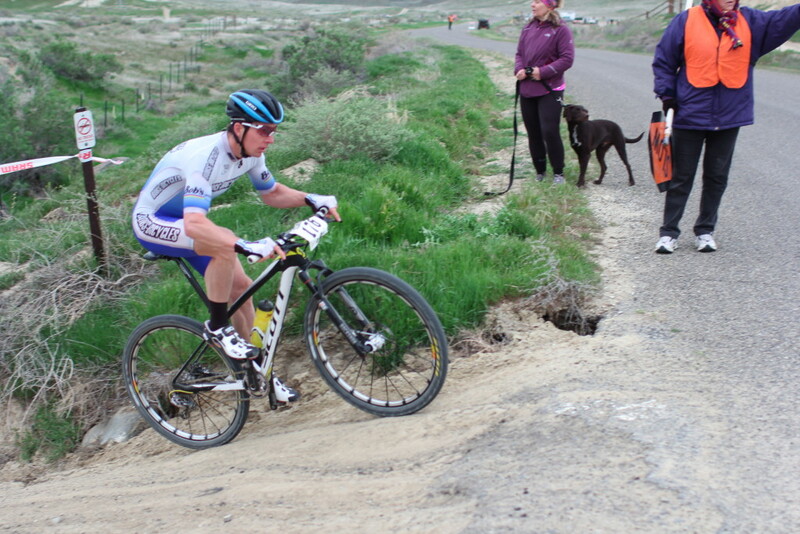 Mike was the only Wild Rockies Race Team member in the Cat 2 race, and he missed the start by ~30 – 40 seconds. At least he did not have to deal with a track obscured by dust, nor first turn bottleneck. 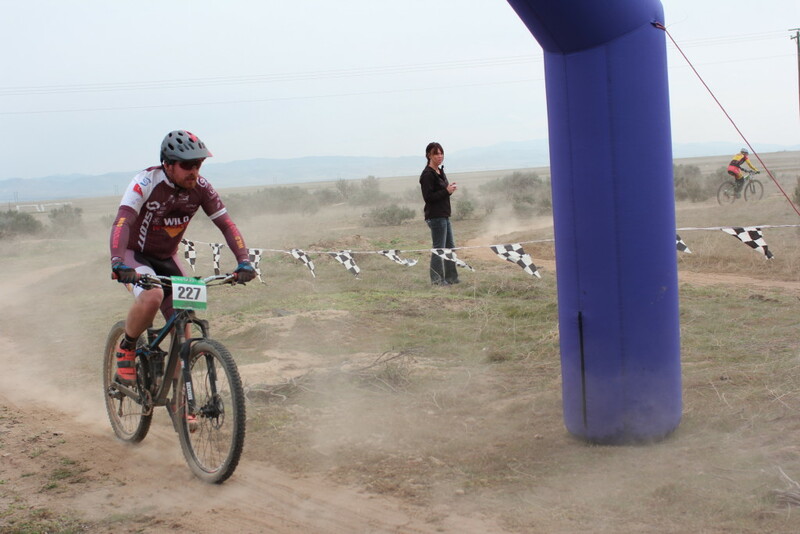 Mike spent the first half of his race chasing down slower riders, and then he led a strong group of four to the finish. Mike took fourth place. 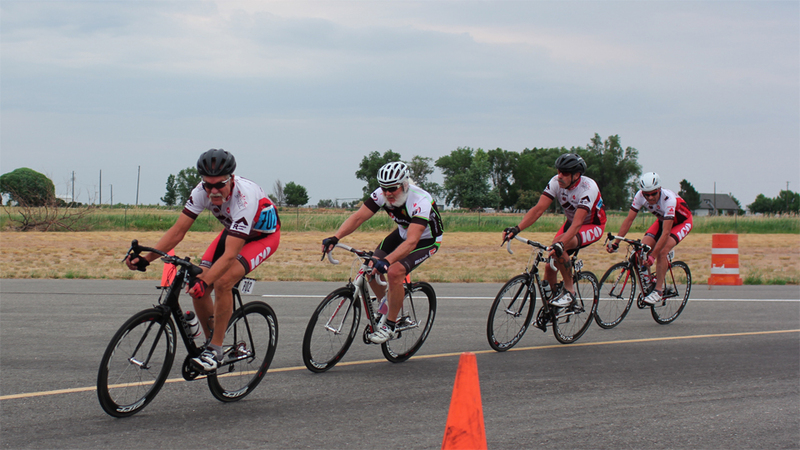 Wild Rockies Race Team had five contestants in the Cat 3 race. Allis took third and Christina took fourth in the Women’s 30-39 race. Casey took fourth in the Women’s 19-29 race. Jed took second in the Men’s 30-39 race. Bruce took third in the Men’s 50+ race. The photographs included in this article were taken by Michele Swan. Most are quite nice. Apologies for the ones that are soft / blurry, off-center. To see / copy the full resolution available in these “quarter resolution” images, click or tap the images to bring-up the attachment page, click or tap on the image magnifier located between the image title / filename and the image, and then right click on the image to copy (on a PC). Instructions to purchase the full resolution photos are available at Fitness and Grace Photo. 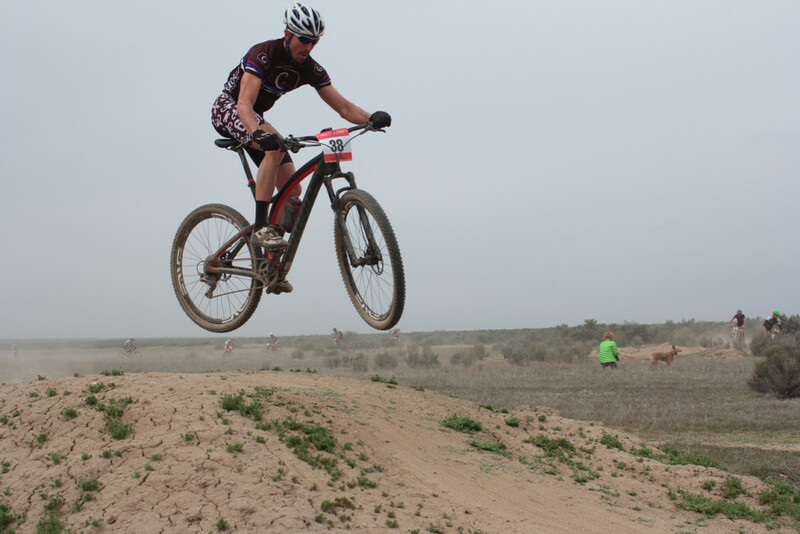 Preview the Barking Spider XC MtB course on Sunday March 22, 2015. Meet at the parking lot at the race site at 11 am. Wheels rolling by 11:15. See attached WR Race Team group photo of participants in 2015 Barking Spider pre-ride.